This Cuban-inspired citrus and herb marinated flank steak topped with caramelized onions and drizzled with some of the reserved marinade was simply delicious. The yellow rice was a nice accompaniment but the particular recipe I tried was not as great as I would have liked, so I'll continue researching it. 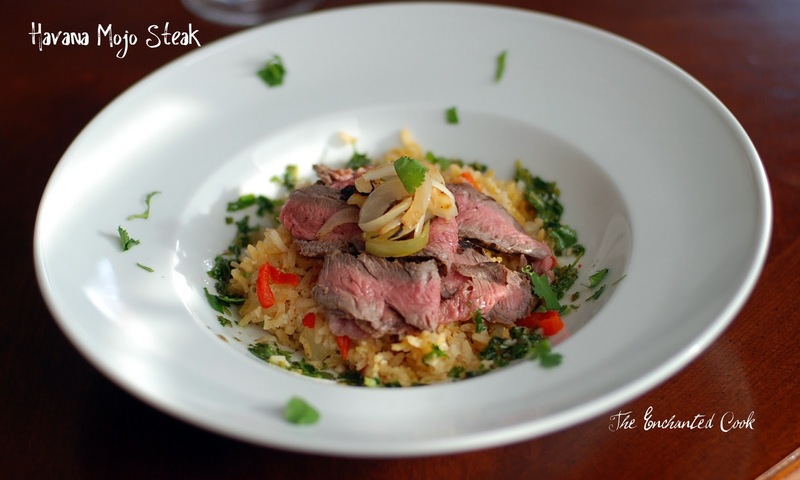 In the meantime, you could put this steak atop a salad or your own favorite rice recipe. I'm a sucker for Cuban food and where I live in Southern California I don't know of any Cuban restaurants. I also don't come across very many Cuban recipes, which makes it a little difficult for me to cook it for myself. So when I saw this recipe card at Sprouts Farmers Market, I grabbed it so fast it would've made your head spin. The fresh-squeezed citrus juices and fresh herbs made for quite a delicious marinade and dressing. In a small bowl, mix lime juice, water, orange juice, salt, pepper, and oregano and set aside. Heat olive oil in a saucepan or skillet over medium heat, then add garlic and cumin and saute until garlic is golden. Slowly add juice mixture and bring to a boil. Heat olive oil, garlic & cumin, then add juice mixture and bring to boil. Remove from heat and let cool, then add cilantro. Pour half of the mixture into a bowl, cover and place in the refrigerator to be used as a dressing/sauce when served. Reserve half the marinade to be used as a dressing/sauce. Place flank steak in a large zip-top bag and pour the rest of the mixture over. Seal, turn to coat, and place in refrigerator to allow to marinade overnight. To caramelize onions, heat a cast iron or regular skillet to medium heat and add butter. Then cook the onions until they are soft and lightly browned. Meanwhile, bring steak to room temperature and heat an indoor or outdoor grill to medium-high. Remove steak from marinade and discard marinade. Grill steak for approximately 4-5 minutes per side for medium to medium-rare. Remove steak and place on cutting board and allow to rest for a few minutes before thinly slicing against the grain and serving with caramelized onions. 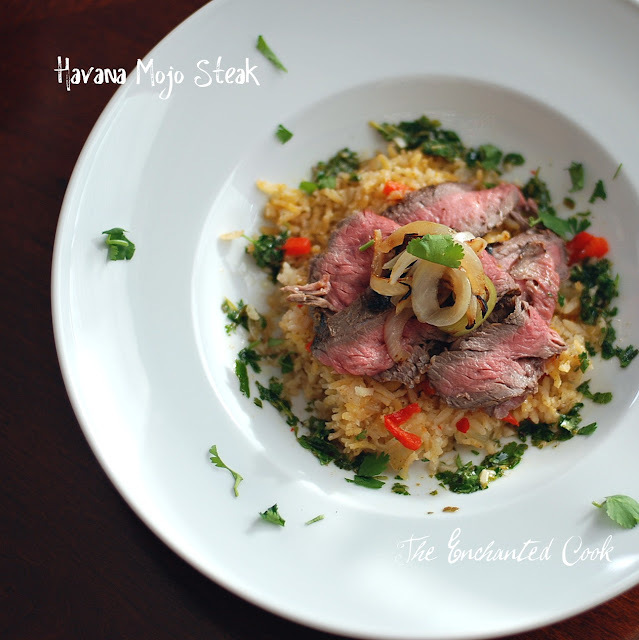 Havana Mojo Steak...the only thing missing is a Mojito! Mangos are everywhere in local markets around here and I couldn't be happier. For some reason, I have really been craving mangos and papayas. Maybe that means I need a trip to a tropical island somewhere? A girl can dream. In the absence of that, I'm just enjoying the fruits of the season. 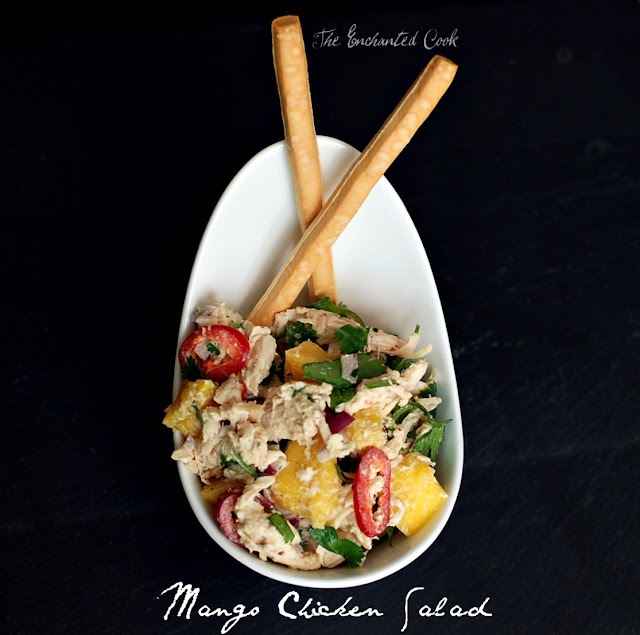 Take this Mango Chicken Salad for instance. So easy, so quick, and dare I say it? Sooooo delicious. I had picked up a rotisserie chicken breast from my local Bristol Farms market thinking I'd make a quick chicken salad - and when I got home I noticed the beautiful red mango sitting on my counter. "Boy, that would go great in my chicken salad", I thought, and then I went to work pulling a few other ingredients out that just sounded good to me...sliced red jalapeno, cilantro, diced red onion...yes, that all sounded like it would go nicely with the mango and chicken. But what dressing would I make? I wanted the mango and the chicken to be front and center, but I certainly needed to add a little something to bring everything together. 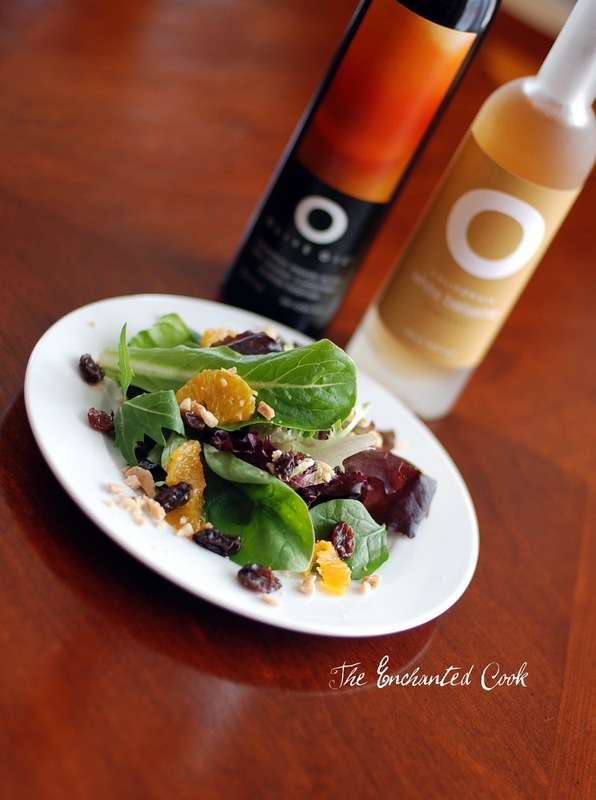 Enter one of my favorite O Olive Oil vinegars - O Citrus Champagne Vinegar. A little of that mixed with some Dijon mustard and mayo and I was in business! 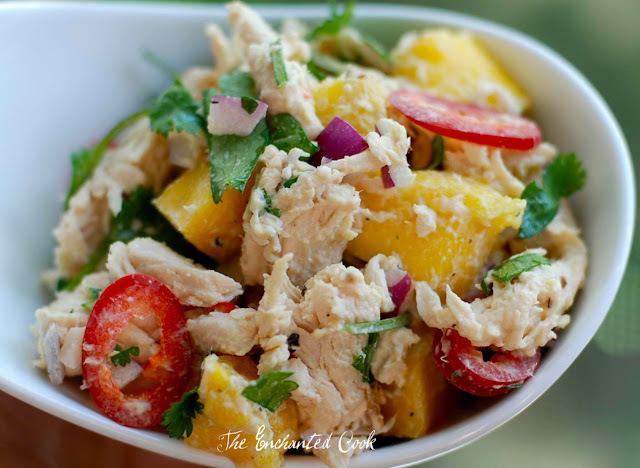 Place the chicken, mango, red jalapeno, cilantro, and onion in a medium bowl. In a separate small bowl mix together the mayo, mustard and vinegar. Then toss with chicken mixture. Add fresh cracked pepper and salt to taste. Serve with breadsticks, crackers, atop a bed of mixed greens for a nice Paleo option, or any way you like! Cook's note: Never cut up a fresh mango before? See HERE for a quick photo tutorial. There's this restaurant I like called True Food Kitchen, it's green certified, they source their ingredients locally, they practice sustainability, and oh by the way - the menu is innovative and delicious. The menu is centered around the philosophies of Dr. Andrew Weil and his Anti-Inflammatory Food Pyramid. We often go there on the weekend for brunch and yesterday we decided to try one of their smoothies - The Weekend Warrior. It tastes like a light version of a peanut butter and banana sandwich on whole wheat bread with just a hint of tang from the yogurt - yum! We split one as a starter and then proceeded to only be able to eat half of our breakfast entrees. It was filling and delicious. This smoothie could not have been easier to whip up at home, so this morning I made a small one before starting my day and wow, was it good! 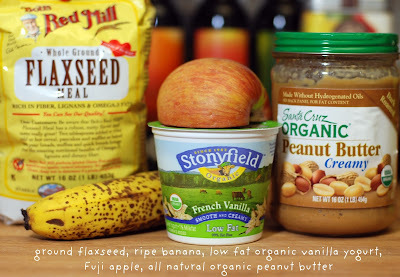 Place all items in a blender and blend until well blended. Pour in a small glass and enjoy! Awhile ago I invested in one of those blenders that pulverizes everything, so I just threw in half of an apple - seeds, core and all. 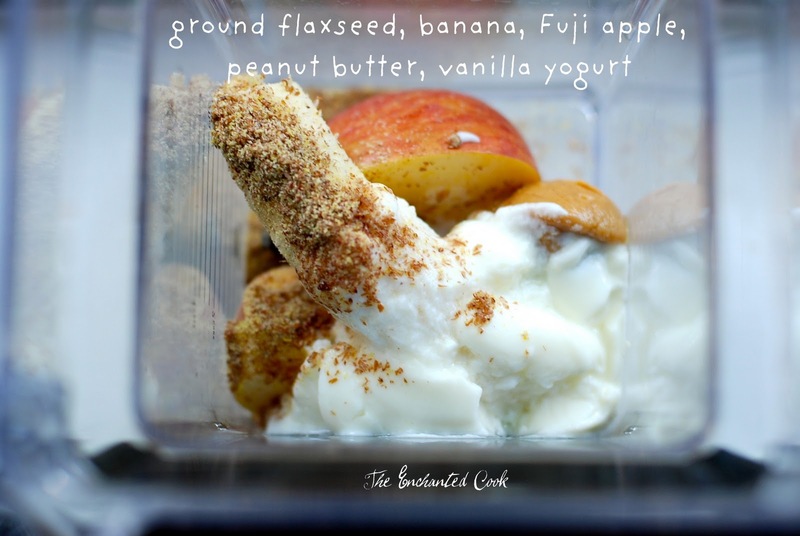 I love this blender - the Blendtec. It's the one they demo and sell at Costco - the one where they make hot soup in it (without using any heat source) - and yes, it really works. You can put anything in this blender and it will pulverize it. I put whole fruit and veggies in it instead of using a juicer to make healthy, fresh juice shooters in the mornings. Of course now I'll be making these delicious smoothies, too. 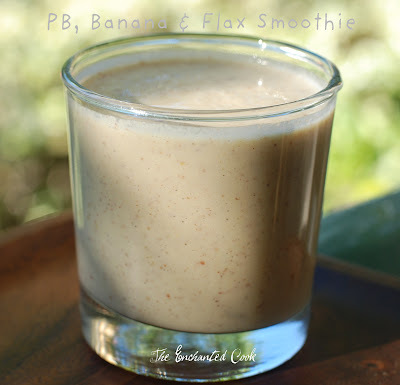 2/24/11 Update: I've made this smoothie for breakfast for 5 days in a row - lol - it's so good and I feel so great all day! There's a great article in this month's (Feb 2011) Food & Wine magazine about the cuisine of Laos, a small country nestled between Vietnam and Thailand. 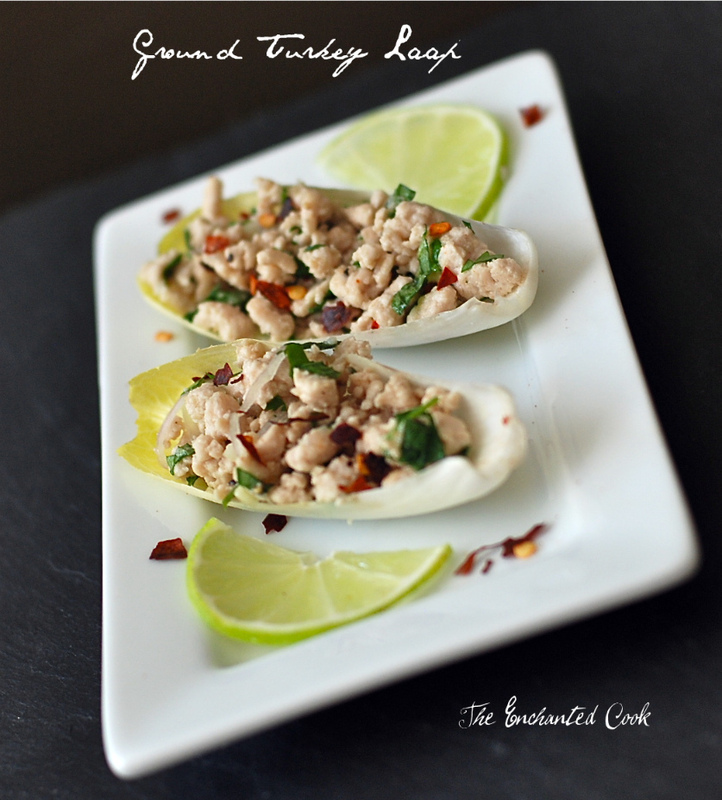 Each of the recipes featured struck my fancy but I selected this simple ground turkey dish to start with. It's light and healthy with fresh, bright flavors bursting through. I loved it as an appetizer in crunchy Belgian endive cups and tomorrow I will enjoy the leftovers atop some sticky brown rice, perhaps with a dash of soy sauce and some of my favorite home made Sriracha sauce. It was so quick and easy to make - something you would never believe from tasting it. One of the most interesting things about the dish to me was the technique of toasting a small amount of rice and then grinding it in a spice grinder/coffee grinder. You add the rice powder to the dish at the end and it helps to gently bind the flavors together. In a large skillet, toast the dry rice over high heat turning in the skillet until lightly browned, about 3 minutes. 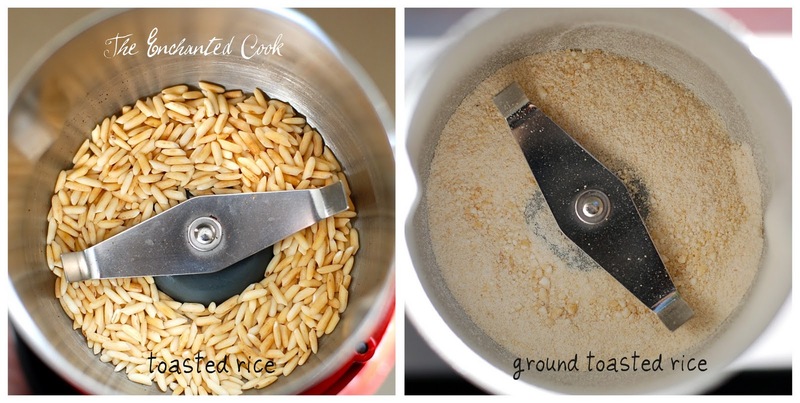 Remove the rice and place in the spice grinder and let it cool. Once cooled, grind the rice to a powder, then set aside. You could probably also use a blender. Return the skillet to the stove, lower the heat to medium high and add the oil. Next add the turkey and cook, breaking it up with a spatula while it cooks. Cook until no longer pink, about 4 minutes. Add the chicken stock and stir, continuing to cook until bubbling, less than a minute. Remove from the heat and stir in the fish sauce. Season with salt and pepper and stir in the lime juice. Let stand for 5 minutes, then add the lemongrass, shallot, cilantro, mint, crushed red pepper, rice powder, and green onion if desired. Stir and serve in endive cups or with rice. Win this swag bag courtesy of California Raisins and Valerie Waters! Recently I had the pleasure of participating in a live video chat with Valerie Waters, trainer to the stars and inventor of the Valslide. Valerie's fitness tool called "Valslide" is quite simply a pair of lightweight disks that you step on and use when doing lunges and other simple exercises. They cause your muscles to work in ways you never imagined and in Valerie's words, "help get you ready for life's red carpet moments". They don't take up much space so they're travel friendly and easily stored if you just want to do a few minutes of exercise a day at home. You can win a pair of these in my Swag Bag Giveaway courtesy of California Raisins and Valerie Waters. Raisins are a healthy treat and I love to mix them with a few nuts and take for an on the go snack. They're also delicious in a multitude of dishes and if you win the Swag Bag, you'll receive a book full of recipes featuring different and delicious ways to use raisins. To enter my Swag Bag Giveaway, just leave a comment below telling me how you like your raisins. 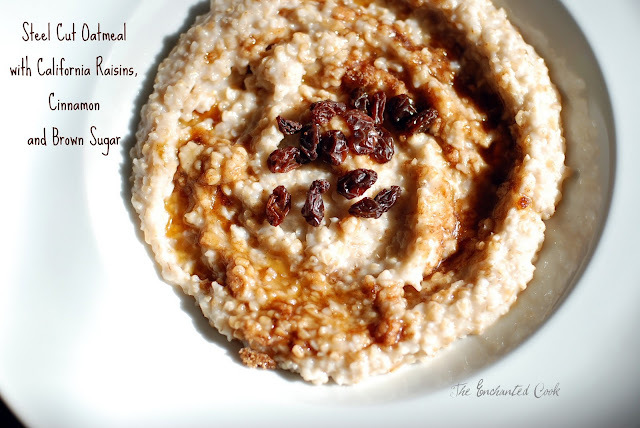 I like them in my steel cut oatmeal! I like them in my salads, too! Leave a comment below no later than 5pm Pacific this Saturday telling me how you like your raisins for a chance to win a Swag Bag full of goodies. Be sure to include your email so I can notify you. One random winner will be selected and notified on Sunday, Feb 13th. Giveaway open to anyone with a US address only due to shipping costs. 2/13/11 - Using a random number generator, the 4th comment was selected. Debbie Guerrero - you have won the Swag Bag! I'll be contacting you via email to get your shipping address. Recently, my daughter Alexa and I went to TruFire Kitchen in Frisco, Texas. There were so many wonderful sounding things on the menu it was hard to narrow down to just one or two so we ordered a few things to sample. 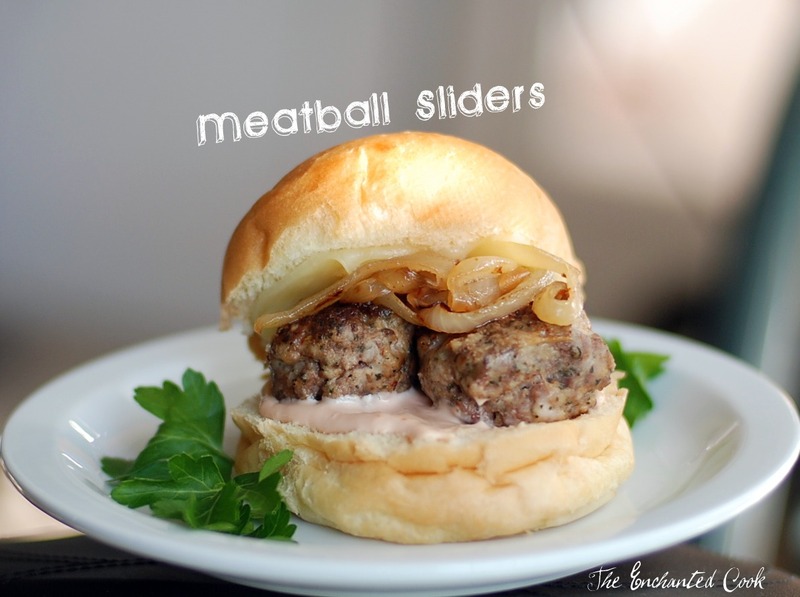 While everything we tried was delicious, by far the best thing we had were the meatball sliders. 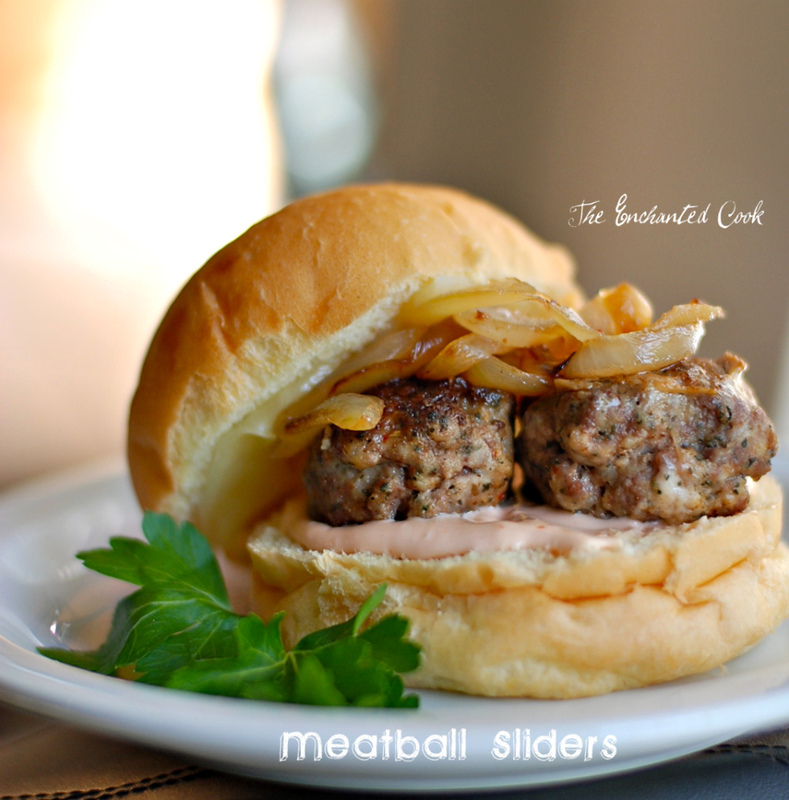 They were tender and meaty, full of herbs, topped with caramelized onions and complemented by a sauce that sort of resembled Thousand Island dressing all piled on a tiny soft buttery bun. They were the kind of unassuming-sounding sandwiches that catch you by surprise and cause you to dream about them later. I was thinking these would be perfect to munch on while watching the Super Bowl (and frankly I was looking for an excuse to make them) so I set out to recreate a similar dish. I'm thrilled with the outcome. In a medium bowl, mix together the beef, pork, bread crumbs, Parmigiano Reggiano, Italian seasoning, salt, and egg. It works best to use your hands to mix everything well. Form 16 small meatballs (about the size you would eat in 2 small bites) with your hands and set aside. Heat a non-stick skillet to medium and add olive oil. Add meatballs and brown on top and bottom, about 3 minutes on each side. Then cover, turn heat a little lower and cook for another 10 minutes or until meatballs are cooked through. While the meatballs are cooking, heat another non-stick skillet to medium-low and add butter. Add onions and salt, and cook until soft and lightly browned, stirring occasionally. In a small bowl mix together the mayonnaise and ketchup. If desired you may butter the buns and toast them in a skillet until browned. (My husband likes them this way and I like them untoasted, so I made them both ways.) Spread a little sauce on the buns, add 1 meatball to each if small rolls (or 2 meatballs if medium rolls), top with onions and cheese (if desired), then place tops on sliders and serve.